Throughout Year 7 to 11 a specific programme is provided to more able students. This consists of weekly sessions to include subject specific enhancement, but also skill enhancement as part of Challenge Club. A Challenge booklet is issued to students in Year 7 and 8 that guides them to complete a number of activities to build independent skills across a range of activities and tasks. On 27th March, Year 7 and 8 students, as part of Challenge Club, visited Merton College at Oxford University. They had a tour of the school and enjoyed learning about life at Oxford University from current students. In March, West London young chefs went head to head in the grand final of the Young Chef of the Year 2019. West London College opened up its TASTE restaurant and training kitchens to young talent in the local area for the Hammersmith and Fulham Borough Young Chef of the Year 2019 competition for the 11th year. The cooking contest saw 12 finalists complete for the top prize! The young chefs prepared two-course meals with ingredients they selected on a budget of just £8. The judging panel included dietician Miranda Greg, Andy Needham from L’Amorosa restaurant, Ross Stacey of the River Cafe and Dipna Anand from Dip in Brilliant restaurant. They judged the competitors on organisation and timing, food preparation skills, hygiene, presentation, taste and nutritional balance. A massive congratulations to you Selsabil! A fantastic achievement and we are so glad all your hard work paid off. On 20th March we celebrated International Day of Happiness! This year's theme was Happier Together, focusing on what we have in common, rather than what divides us. The day began by giving every teacher a Banana of Happiness – a banana with an inspirational quote written in sharpie! 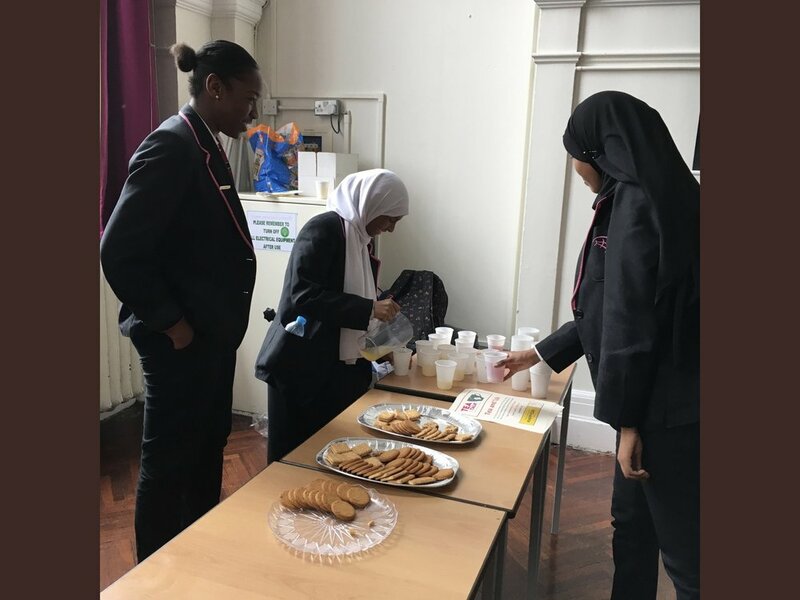 At lunchtime our staff and student Mental Health Ambassadors hosted a tea and talk where they sat down with the other students in the school, served them juice and biscuits and listened to any problems they may have. We even had a flash mob from Glee Club on the astro-turf at lunch time! They sang You Will Be Found by Dear Evan Hansen! The day really brought the whole student community together. Thank you to all the students and staff who made everyone’s day that little bit happier! The Thames 100 is a 100 miles continuous trail race along the Thames path from London to Oxford. The 100 mile course is a marked point to point race which takes runners from Richmond in South West London to the centre of Oxford. The course follows the meandering route of the Thames against it's flow and is flat and fast with the majority on groomed paths/trails and paved pathway. There are some truly stunning sections of the route showing off the best of English riverside scenery and life on the Thames. On April 1st, associated with Fulham Reach Boat Club, our girls took part in the annual 100 mile relay row from Oxford University all the way back to the Fulham Reach boat house. Each school involved is pushed to their physical limits with a 20 miles row each to complete the full 100 miles! 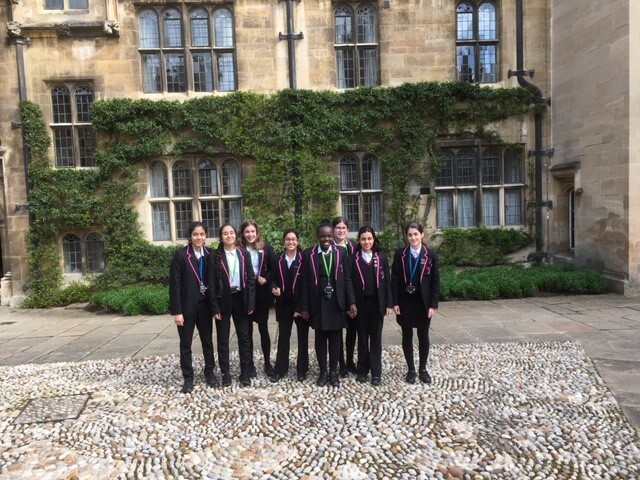 Prior to the event, our girls were lucky enough to have a tour of Pembroke College, Oxford and see what campus life is like for an Oxford University student. Well done for completing the 20 miles stretch girls! We are so proud of your achievements. Fulham Cross students were celebrated at the Jack Petchey Achievement Awards Tri-Borough ceremony at Kensington Hall in February. The students were among young people who were nominated for the awards in recognition for their outstanding achievements at school and in the wider community. The students were chosen by teachers and peers based on three categories, some were nominated for the extra effort and energy they put into their studies despite trying circumstance, and for being a positive influence on their peers. Other nominees were picked for their contribution to enrichment Fulham Cross’s student community. The ceremony was an opportunity for staff, family and friends to congratulate the winners on their achievement and celebrate their success. All students received medallions, a certificate, a badge and £250 grants, which will be redirected into school-wide activities. The Jack Petchey Foundation was set up by Sir Hack Petchey CBE to inspire and celebrate young people’s personal growth across London and Essex. 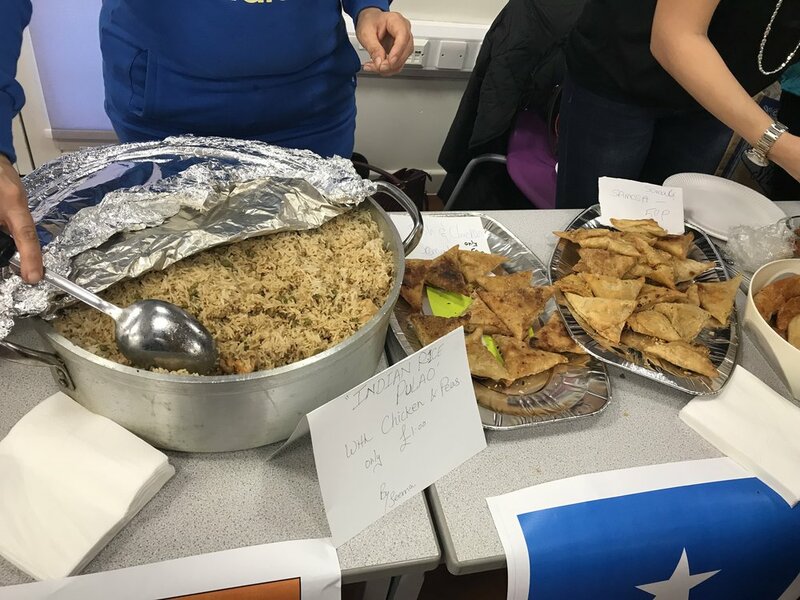 On 21st March we hosted our annual International Dance and Food Evening! 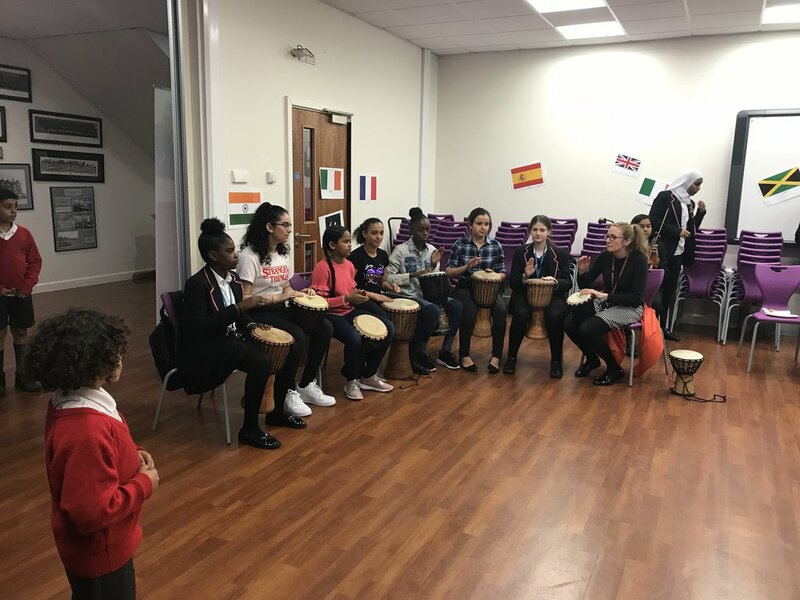 The event began with a musical performance by students on the bongos, followed by a violin solo by a Year 9 student. 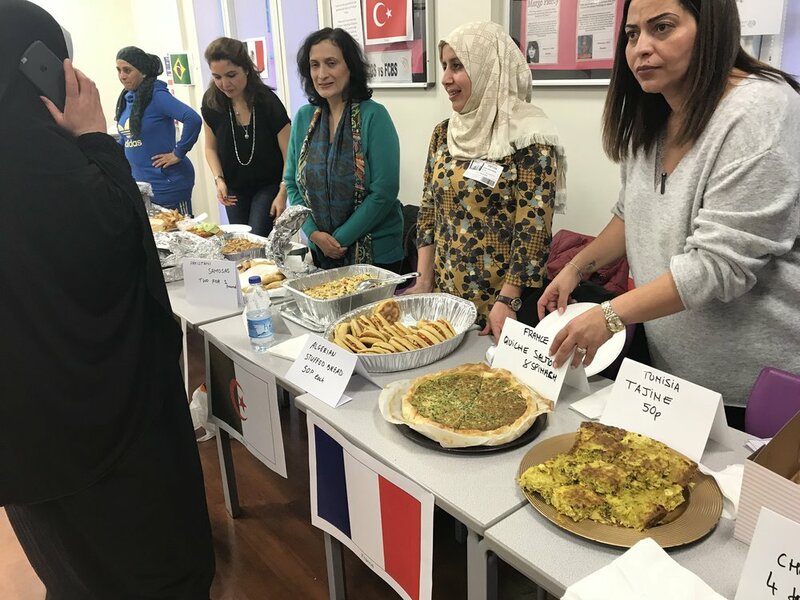 Parents and teachers were then treated to culinary delights from all around the world! From Belgian waffles and Somali cake, to Gulab Jamuns and Tunisian tajine – we were spoilt for choice. For the second half of the event, all guests made their way to the hall to watch a fantastic array of solo and group performances by our students. 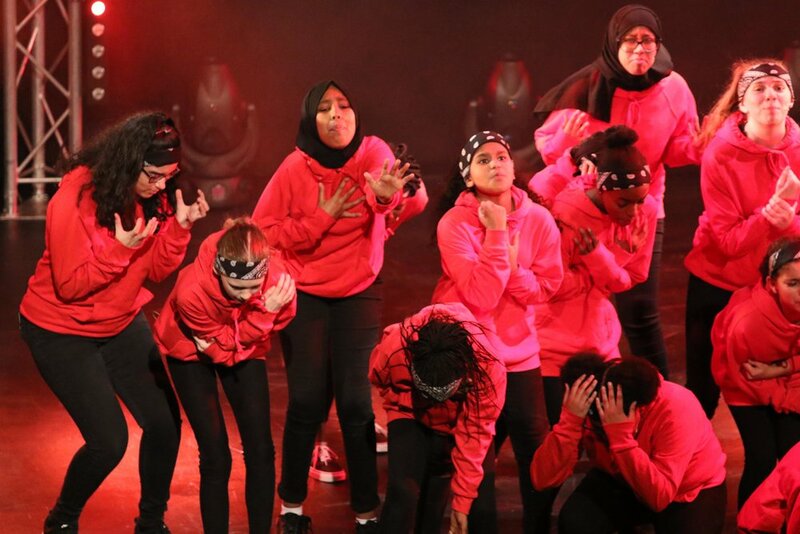 We were treated to all types of dance routines from all around the world – from street and African to Bhangra and contemporary we were overwhelmed with the variety and dedication the girls had put into each and every performance. We had such an amazing evening celebrating our rich and diverse community and all the money raised on the evening went to charities picked by the students – Barnados and SKSN. Thank you to all the teachers, parents and students that contributed, supported and came to cheer! On 13th March, our girls received an EMPOWER talk from our Marketing and Communications Officer, Daisy Heath-Abbott told the girls about how she got into marketing and what her job entails. The girls heard about the different jobs she had worked in – from washing pots whilst at University to working at The Daily Telegraph – it was clear that Daisy’s message was all about taking every opportunity that comes your way. The girls were particularly interested in her tales of travelling across South-East Asia and hopefully feel inspired to go and create their own stories. It was a great breakfast and the girls asked lots of interesting and thought-provoking questions. The 10 highest attaining Year 10 students were rewarded for all their efforts with a trip to Merton College at the University of Oxford. Students took part in workshops of how to choose their A level subjects to lead to their university degree and also heard lectures from three post-graduate students on Forensic Anthropology and Law Ethics. Our girls were an absolute delight – they were hosted by current student Aaron who showed them around his campus as our students asked him countless questions. After the tour, student participated in public discussions during their lectures. This term, we have been trialling out the SHED Method on our Year 11 students in the run up to exams. Our staff and Year 11 students have had coaching from Sara Milne Rowe. Sara is one of the UK's leading performance coaches, having founded Coaching Impact in 2004. She works alongside senior leaders, teams and individuals within creative and media industries and education. Our Year 11 students have had coaching sessions in the form of assemblies with Sara and her team, and also bespoke videos, filmed especially for our girls to be played at tutor time. The SHED method is used to help students manage their minds and reach their full potential, especially during exams. The girls have been taught different breathing techniques, how to tackle self-doubt and have all been given a Boom Diary to fill in. We are so excited to be a part of these coaching sessions and we can’t thank Sara and her team enough for all the hard work and dedication they have put in to helping our girls feel empowered and ready to tackle any challenge. We look forward to seeing what else SHED can do for our girls! Year 11 students studying GCSE Religious Studies visited Shaftsbury Baptist Church to attend a Candle GCSE Conference on ‘Creation’. Students examined key topics as part of their GCSE linked to when does life begin, is killing ever justified and do people have the right to get help for having children, including genetic engineering. Year 13 students at Putney High School, who are ex-Fulham Cross students have received amazing UCAS offers this year. We were informed this week by the Headteacher at Putney High that one of our ex-students, Miriam, has received a clean sweep of offers to study Medicine at Imperial, Kings College London, Queen Mary’s and University College London - all highly prestigious universities. What an amazing future you all have ahead of you - we are so proud of all our ex-students and the amazing academic achievements they continue to bowl us over with! On Friday 22nd March a group of Year 10 students from the Hospitality and Catering course competed against a range of London schools to become the Winners of Pret a Mangers ‘Pitch and Pret’ newly developed sandwich. Sadly, the students did not win, however received excellent feedback regarding their vegan inspired sandwich. The sandwich named ‘Vegan Fusion’ included sweet potato falafel and guacamole and tasted amazing. Well done to Nadira Chaoui, Kiah Reeves, Malak Abuqamar and Sarah Yishak for their contribution. 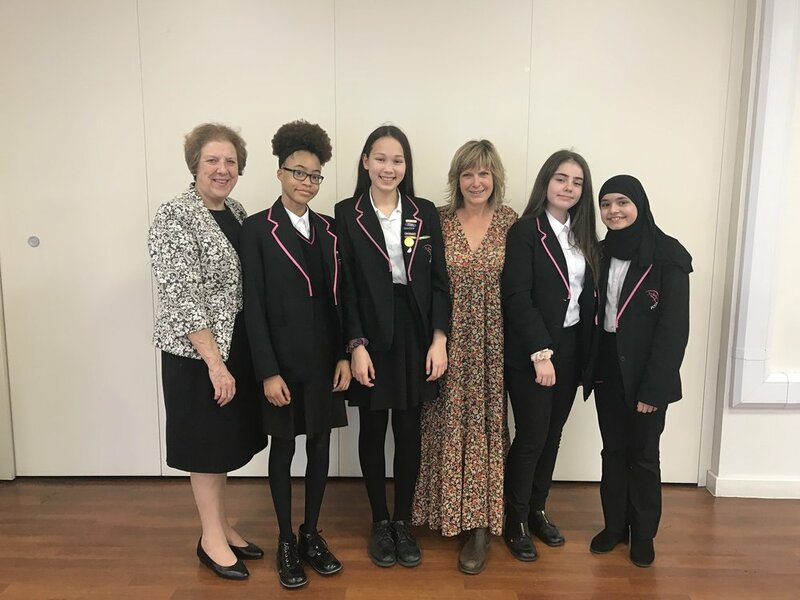 Earlier this month we were lucky to welcome Penny Smith into our school to give an empowering speech to our girls about her amazing life! Penny told the girls about how she got into journalism! From being an Au Pair in Belgium to training for three years in shorthand, law and media ethics. The girls were particularly wowed by Penny’s extensive and amazing travelling stories! Penny worked in a restaurant whilst working at the newspaper in order to save as much money as possible to go travelling the world. Penny went off travelling for two and a half years and told the girls different tales - from falling off a bus, to being in the middle of an earthquake and mudslide! Whilst travelling, Penny worked at Radio Hong Kong for 8 months in order to save more money to continue her travels - giving her valuable experience. At the end of the inspiration tales of Penny’s life she told the girls her favourite quote: “Life is for living”. The girls had so many questions to ask Penny, ranging from her life as a journalist and presenter on GMTV to her colourful travel stories. Thank you so much Penny for coming in and inspiring our girls and staff - we hope to welcome you back to Fulham Cross again in the future. Thursday 7th March was World Book Day and we celebrated the day in true Fulham Cross style! Year 7s had an exciting workshop with the hilarious author of the It Girl series - Katy Burchall! They students asked her questions about being a published author and her inspiration for 14-year-old It Girl, Anna! We had a whole-school Book Bake Off where sweet-toothed book-lovers used their imagination to create book-themed cakes and sweet treats! The top three creations won book tokens. We hosted a design a bookmark competition where the top two winning designs were made into official bookmarks for our schools library. During lunch we had a book cover treasure hunt, where budding literary sleuths had to track down the book covers of famous female authors which were hidden across the school to win lots of prizes. We encouraged girls to bring in old books to swap with other students or to donate to the library and we had a whole-school DEAR event - Drop Everything and Read where all students and staff stopped lessons to get their nose into a good book. If that wasn’t enough, we also gave all students a £1 book voucher which they used to buy a special £1 book or put towards the cost of a more expensive book - we also had a selection of £1 books for sale in the school library. It was such an amazing day - celebrating the world of literature! Thank you to everyone who contributed, baked, read, organised and got involved on the day! 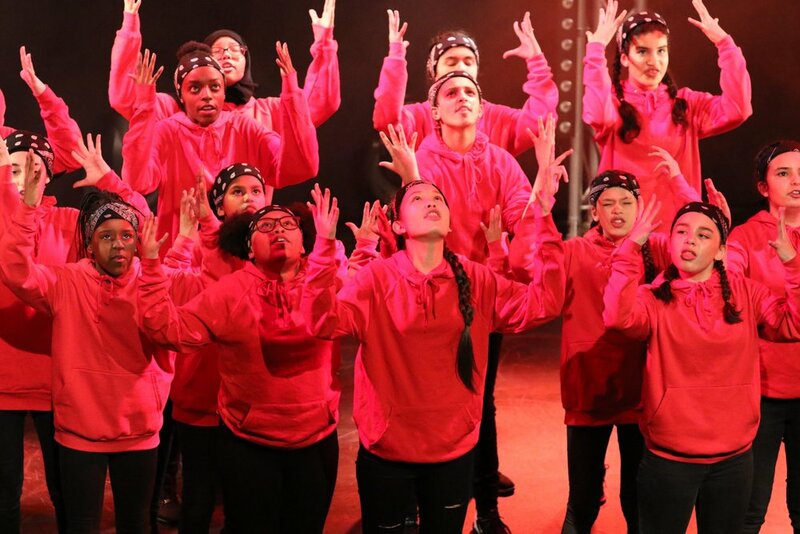 On Sunday 10th February nine groups, made up of 181 young performers, competed in the Glee Club Regional Final in Barking at the Broadway Theatre. The night was full of talent, singing, dancing and lots of teamwork as the young performers competed for a spot in the Glee Club Challenge Grand Final. The performers Glee Club Challenge journey first started in the Summer, when they applied to take part in the competition. 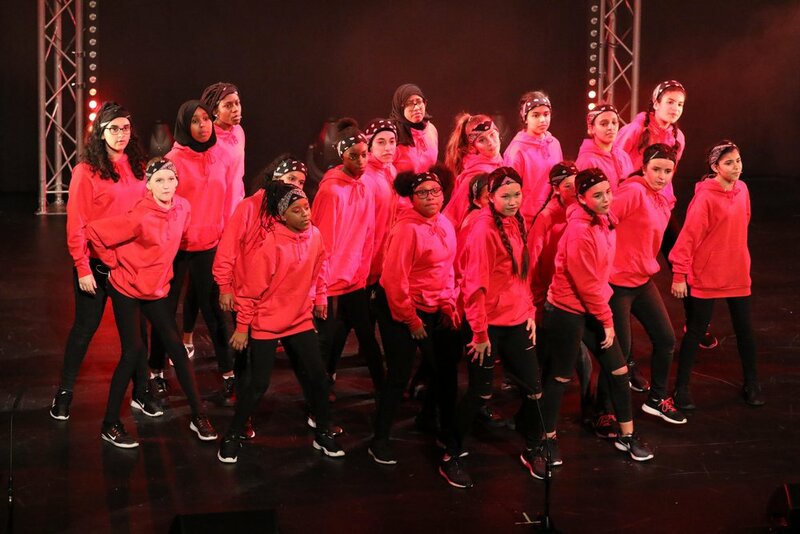 Since then, all of the groups have been taking part in bootcamp sessions, where they have had the chance to work with professional performers to develop their skills and get ready for the live shows. The young people have managed to gain so many skills, develop their teamwork to work together and get up on stage to have fun! To determine who would go through to the grand final, there was a star-studded judging panel. West End star Kate Leiper, who has appeared in Jersey Boys and Evita, was joined by the Jack Petchey Foundation’s very own Jane Evans and Glee Club Challenge trainer and actress, Jeanne Stacey. They had the very tough job of deciding which of the incredible groups would go through to the Grand Final in London. Our girls danced amazingly and did us all proud and managed to come 4th! What an amazing achievement. We are pleased to inform you that our Year 9 student, Sakina, has been selected as a finalist for the Linnean Society’s 2019 BioMedia Meltdown competition. The artwork was selected from over a thousand entries by young people from all across London. The winner will be announced at a celebration event on the evening of March 28th, which will take place at the Linnean Society headquarters in Central London. Congratulations to Sakina, and good luck in the final! On Wednesday 30th January, Year 11 Art students had the opportunity to visit one of the most prestigious and world renown galleries in the world, the Tate Modern. Set on the banks of the Thames and overlooking London’s busy cityscape, students visited the 10th floor of the Tate Modern to study the views and get inspiration for their exam projects. Students had the opportunity to study a range of works from the various exhibitions at the Tate, many of which will be helpful for the development of their final GCSE projects. We are delighted to be working in partnership with First Story this year. By working in partnership with them, our students and staff have joined a national community of young writers developing their voices, improving their confidence and discovering the pleasure and power of creative writing. Throughout 2019 First Story will be hosting creative writing competitions, festivals and events and CPD opportunities for our staff! We will also get to launch our very own special First Story anthology. We look forward to the next year ahead working with First Story and seeing what our amazing students and staff can produce! After receiving roughly 100 applications for our Mental Health Champion Training, 20 students were chosen, five from each Year group. All of them attended training on Tuesday 22nd January, which covered key symptoms, signs of prevalent mental health illnesses, confidentiality, child protection and referrals, listening skills, approaching and assisting students, steps to wellbeing and how to look after their own mental health. Students have been instructed that in case of any disclosure of self-harm or suicidal thoughts, the first and only step to take is a referral to staff who will follow the usual Child Protection Policy. During the workshop, students had a visit from Jayne Kelly, a Psychotherapist based in West London, who spoke to them about her role and answered students’ questions. Thank you Jayne for you time and input. The girls really appreciated it. We were impressed with how articulate and informed the students were, especially Year 8s who had such a mature and sensible attitude. Students suggested many ideas, such as a regular Tea and Talks, a worry box, discussions, half-termly assemblies, monthly mental health days, social media and how it could be used positively, etc… Students were asked to put their ideas in writing to us. As it is important for the champions to get an opportunity to vent out their own feelings on a regular basis, we will be holding weekly check-in clinics for them to discuss any arising matters or even to just have a chat with a dedicated member of staff. At the end of the session, students completed evaluation forms and feedback was extremely positive; students really enjoyed the training. They all received a yellow badge and certificates to award them for their dedication and hard work during the day. We are pleased to announce that our brand new, state of the art Science building and gym is due for completion in Spring 2020! Our building contractors, Morgan Sindall, have been busy over the Christmas period and our old building is now being demolished. Yesterday, from the staff room window, we could all see Ms Woodroofe’s, one of our Science teachers, old classroom get torn down. We can’t wait for when the builders start constructing the new build – we are so excited! Make sure you keep checking the website to track the progress of our new building.